Hello, doves. Sorry it's been a couple of days, life's been crazy. Thankfully, I went to bed so very early last night that despite the fact that it's gloomy and pouring outside my window, I woke up in a great mood, ready to make the most of today, and kick it off with a blog post :). Yay. As a belated Travel Tuesday, how 'bout we answer the $100 question, where are you road trippin' to? Cali, baby. and eventually, touching down in the ultimate half-way point, San Francisco--I did visit the Bay Area as an eager 14-year-old so rather than schedule the obvious tourist experiences, I'll be exploring the creative galleries, shops, restaurants, and burritos. I hear they have some really great burritos, among other foods :). This is not to say that I won't take a cliché picture in front of the Golden Gate Bridge though, because I most definitely will. and then an overnight in Requa, or another northern Californian city within minutes of views of the Pacific Ocean and the majestic forests of National Redwood Park. After that, it's off to the Northwest, but I'll leave that for another week. Any questions, suggestions, or meeting propositions? Don't hold back :). In the mean time, I am trying to enjoy home, or at the very least, the city that feels like home, New York. 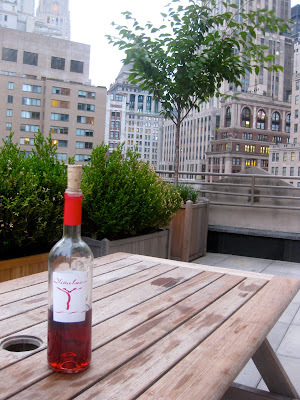 A few nights ago, Leslie and I sat atop her roof with an incredible Spanish rosé (seriously, it is dry and light and perfect, try it for yourself) and massive salads discussing it, among other things. Although I cannot wait to experience life on the West Coast, I know that no matter where I end up, I will always be somewhat of a New Yorker at heart. "'I LOVE NEW YORK' is the oldest one in the book, conventional wisdom in all caps. and yet, it still somehow retains its potency, and why is that? Because only a fool would think otherwise. We are a city that rains prosperity down on the whole country, exporting everything from war heroes to canny socialites to great filmmakers rediscovering their top form. We offer hot dates, hot waiters, hot bands, and hot neighbors. we are the base of more political mojo than any state in the nation and of an angry guy who is single-handedly holding up one of the biggest real-estate projects in the city’s history. Plus we hold fast to the faith that our drinking water tastes better than everyone else’s, even though that is almost certainly not true. But if all that is just a little too hard-core for you, wake up early tomorrow morning and walk the streets at dawn. At that hour, the city belongs neither to the corporate machers who run the town nor even to the hardworking millions who sustain it. It belongs simply to you." Told you we're biased ;) then again, I also adore my hometown in Westchester suburbia. Two Qs for you: Are you more of a city or a country gal (or guy)? And, what makes your hometown, or the city nearby it, special? Although I'm definitely country girl at heart (I work on a farm, for crying out loud) I really enjoy spending short amounts of time in cities. My dad was born and raised in on the Upper East Side so I often go back to NY to visit family. Hmm what makes my hometown special.. well, the history! Plymouth MA ain't called "America's Hometown" for nothing! oh, you are going to be so close yet so far from me in Cali...:( you should have made your way to San Diego/Orange County!!! Wow - such beautiful pics, Danielle! So jealous that you'll be gallivanting around the West coast! I've only been once, and I'd love to go back someday. I've been bitten by the NYC bug. I'm such a city girl at heart, and I know deep down I need to move to a big city in the near future. It's going to happen, I swear. I've grown up in small (and very elderly!) cities and never felt that click that this is where I need to be, but anytime I've gone into a cultural epicenter like DC, NYC, or Chicago, I've felt so at home. I am definitely a bona fide city girl, though I grew up in the suburbs (and not far from "the country"). I live in Minneapolis, and I could talk you to death about why it's an EXTREMELY underrated city. ;) Most people think of Minnesota as a "flyover state," but Minneapolis is one of my favorite cities in the world - and I love to travel! :) I can appreciate a weekend getaway to the country, but after a couple days, I'm ready to get back to the city. That said, I love New York, too! It's an amazing, amazing city. I'm definitely a country guy, mostly because I appreciate the local economy and sense of community that small towns have. Cities can pull it off if they're done right (clean, good urban planning), and rural areas have their drawbacks (mostly health related), but there are no bigger turnoffs for me than flashing neon lights, corporate logos, and noise pollution. Anna: I have always wanted to work on a farm. Do you think your family would hire me if I don't end up getting a job in the city? ;) Your town sounds adorable. Trying To Heal: Oh no! I would've liked to go up the entire coast but I have to make it back to Syracuse in time for Homecoming and I just couldn't fit it in. I'm sorry :( we'll be in touch though, maybe something can be arranged. Jessie (Bites and Pieces): I love the happy-medium of Suburbia. Thank you, dear! Let me know the next time you visit NYC. Gabriela: Aw, thanks so much! Rachel: It is a crazy thought but good for you. Too many people flock all the time there anyway ;). You said it, let me know next time you're in the area! BroccoliHut: Ah, I cannot wait! I'll give you tips when I come up with them :). Faith @ LovelyAsCharged: Wonderfully put, see you in a metropolis soon :). Jess - The Domestic Vegan: Oh, I would love to visit Minneapolis! leslie: Haha. You're going to have a fantastic vacation... and one of the best parts is that you'll be able to return home at the end :). barncathollow: I can definitely understand the appeal to the countryside and small towns. I think every place, big or small, has it's drawbacks which is why it's so important to have a great group of friends and/or family no matter where you may live. Simply Life: You're telling me! Since you're going to be in Santa Barbara and heading up to SF, you should definitely stop in San Luis Obispo. Thursday nights from six to nine is the downtown Farmers Market - live music, crafts, local produce, dance performances... lots and lots of people watching. Very fun! It's a very beautiful spot - Pismo Beach and Avila Beach are on the way as well.